On November 20, Nguyen Ngoc Nhu Quynh (a.k.a Me Nam/Mother Mushroom) was awarded one the 2018 International Press Freedom Awards for her commitment to free expression in Vietnam. In a short acceptance speech, she gave thanks to her supporters and emphasized her continued fight for human rights in Vietnam. She also called on people to take action in the case of Tran Thi Nga. On November 13, Quynh started her campaign for Vietnamese human rights in Washington D.C. She particularly highlighted the case of Tran Thi Nga, who, like Quynh was, is a female political prisoner who has young children. She presented information about the Formosa environmental disaster and the heavy sentences authorities imposed against activists involved in protesting it. Quynh also gave thanks to those agencies and people who assisted in her early release from prison in October. During her time in D.C., she met with Voice of America, the Editorial Board of the Washington Post, EU representatives, the US State Department, Radio Free Asia, the office of Senator Marco Rubio, and the Committee to Protect Journalists. She also spoke out about Vietnam's tactic of forcing political prisoners into exile in exchange for early release from prison. After over two years in prison in Vietnam, Nguyen Ngoc Nhu Quynh was suddenly released from prison on October 17 and sent immediately into exile in the United States. She was accompanied by her mother and two young children. Her release came as US Defense Secretary Mattis was in Vietnam for a short visit. It was later confirmed that she arrived safely in the US, where she's vowed to continue her work. Quynh said that she did not want to leave Vietnam and was reluctant to be exiled. 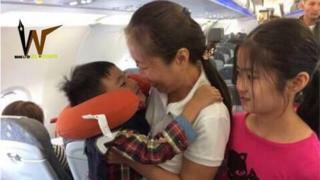 After arriving Houston, Texas safely she said on October 19 that “if she had the right to choose, she would stay in Vietnam. But she has two children, she had to consider their future." Quynh is from Khanh Hoa province. She studied foreign languages in university and reportedly began engaging in more political conversations thereafter. She began blogging in 2006. 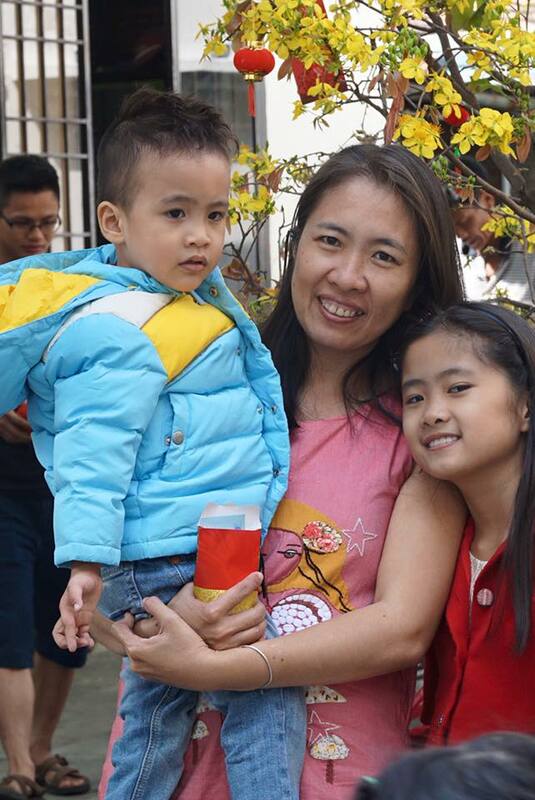 Quynh is a single mother of two young children. At the time of her arrest in 2016, her daughter was 10 years old and her son, 4 years old. Quynh is a co-founder of the Network of Vietnamese Bloggers. She has written about politically-sensitive issues such as police brutality, corruption, and environmental degradation, and is also active in the offline human rights community. She is well-known for her coverage of the 2016 Formosa toxic spill and its subsequent fallout. Quynh was awarded the International Woman of Courage Award from the US State Department in 2017, which she was unable to accept in person. She was also Civil Rights Defender’s 2015 Civil Rights Defender of the Year. Quynh’s mother, Nguyen Thi Tuyet Lan, was caring for Quynh’s two young children while Quynh was in prison. Lan was followed and harassed by authorities since her daughter's arrest. Nguyen Ngoc Nhu Quynh's letters to her family were withheld without either of them knowing why and how. Her mother, Ms Nguyen Tuyet Lan, only knew about the letters when Quynh called and asked her whether she had received them. Ms Lan had received neither letters from Quynh nor greeting cards from international non-profit organizations. Quynh was serving her ten years imprisonment sentence in Prison No. 5, Thanh Hoa province, thousands of kilometers away from her family. The distance and her family situation - her elderly mother was the caretaker of her two young children - made it difficult for her mother to visit her. Every month, Quynh was only allowed to make a five minute phone call home, and her family relied on the letters to communicate with her. Ms Nguyen Tuyen Lan, Me Nam's mother, talked about her daughter's case, and the family's life after her sentence, in this video. Arrested September 3, 2009. Released September 12, 2009. In September 2009, Quynh was arrested for 10 days after posting on the Internet her opinion against the Bauxite mining project in the Central Highland and the state's policy towards China, being accused of "infringing upon national security." She was released as the police determined that her actions were not "serious enough" to press charge against her. Arrested October 10, 2016. Sentenced to 10 years in prison under Art. 88 (1999 Code). Released October 17, 2018. Quynh was arrested in Khanh Hoa province on October 10, 2016, for spreading "propaganda against the state," and was in incommunicado pre-trial detention until her trial on June 29, 2017. Quynh was sentenced to ten years in prison in a one-day trial. The trial was brief, secretive and guarded, continuing a pattern of trials in recent years with few or no outside press, family, or community members allowed. Her mother was barred from attending the trial. An appeal court in Khanh Hoa province upheld her ten-year prison sentence on November 30, 2017. Quynh admitted to her activities but defended her right to free speech and maintained her innocence. Following the usual pattern for trials of activists charged under "national security" provisions, the trial was secretive and short, lasting only three hours. Supporters were prohibited from entering the courtroom, and after protesting the decision outside of the courthouse, many supporters were violently dispersed by pro-government thugs. Quynh's mother had written to EU representatives earlier in the week, urging them to attend the trial, since Vietnamese trials of activists are frequently touted as being open. One of Quynh's defense lawyers, Vo An Don, was disbarred just days before the trial. Authorities made it extremely difficult for her mother to visit her in prison, and Quynh was suffering from a hand issue. Quynh was in poor health overall, and her mother’s requests to send vitamin supplements to Quynh were denied. According to her mother, in an October 2017 visit, Quynh looked pale and weak. She had not been able to sleep at night as she had cramps due to the cold weather. Her mother brought in a sealed bottle of Calcium and D3 for Quynh but the prison authorities refused, giving the reason that “there’s no doctor’s prescription.” Her request to send Quynh a Bible was also denied because, as the authorities explained, apart from “The People,” the official newspaper of the Communist Party of Vietnam, no other books or magazines are allowed in prison. Mother Mushroom was transferred from Khanh Hoa in southern Vietnam the the northern province of Thanh Hoa. She was moved to Prison no. 5, which is notorious for its poor conditions. Her mother only found out about the transfer after attempting to visit Quynh. She had visited Quynh only a week prior as well, and the authorities made no mention of an upcoming transfer. This transfer put a strain on Quynh's already difficult family situation. The 88 Project considers this transfer a cruel emotional tactic, meant to isolate Quynh further from her family and support system. Quynh ended her hunger strike after sixteen days. From July 6-July 23, Quynh was striking against inhuman prison conditions. She ended her strike after a visit from a US embassy representative. On September 26, 2018, Nguyen Thi Tuyet Lan, the mother of Nguyen Ngoc Nhu Quynh, visited her at Detention Centre 5, Yen Dinh District, Thanh Hoa province and updated Quynh's supporters that she had not recovered from her 16-day hunger strike, which ended on July 23. At the visit, Quynh was thin, with her hair was falling down and her complexion dull. On September 19, Quynh made a phone call to her mother and reported that her cellmate was still harassing her. However, in the meeting on September 26, she informed her mother that the female prisoner had gradually changed her behavior and was no longer harassing her as before. Quynh gave an interview in which she described harsh prison conditions that she faced, including a lack of privacy for female prisoners and multiple hunger strikes, the longest being 16 days. While she believes her release coincided with Mattis's visit to Vietnam, she denied the claim that Vietnam is softening its stance on political prisoners. Release in exchange for exile in a common tactic used by the Vietnamese government, such as in the cases of human rights lawyer Nguyen Van Dai and blogger Dieu Cay. In her letter written on October 19, Quynh gave thanks to those who were concerned about her and helped her to obtain this freedom. She acknowledged the heavy sentences handed to dissidents, including Tran Thi Nga, and looked back at the pictures of the police searching and confiscating her banners from Formosa protests. She called for people to continue fighting freedom in Vietnam. According to her mother, in an October 2017 visit, Quynh looked pale and weak. She had not been able to sleep at night as she had cramps due to the cold weather. Her fingers curled up on one hand. The authorities denied some supplies from her family, including vitamin supplements and the Bible. Quynh’s defense counsels, after meeting with her in preparation for the appeal trial, also reported that Quynh suffered from headaches and could not sleep as a result. Nguyen Ngoc Nhu Quynh's mother, Nguyen Thi Tuyet Lan, visited her in prison briefly on February 5, 2018, and reported that Quynh was still in poor health, with curled up fingers and toes, and she had recently suffered from an allergic reaction to medication. The prison had denied Quynh medication from her mother. Quynh was on a hunger strike in prison. Her mother learned in a May 31 visit that Quynh was on strike from May 5-11, refusing to eat food she said was making her sick. She is one of many prisoners who have claimed that the food supplied to them is unsafe. She had been also denied letters from family and friends, as well as outgoing mail, and a Bible. Nguyen Ngoc Nhu Quynh was on a hunger strike, despite the requests of her mother and some supporters. Quynh originally launched the hunger strike in an attempt to get prison authorities to transfer her to a new cell away from a verbally abusive cellmate. She was transferred, but her new location lacked privacy, and she was still being mistreated; thus, she decided to continue her strike. Her mother was able to send some new clothes and an English book, but the Bible she sent was returned. Quynh was currently enduring extremely difficult conditions in prison, described as “mental torture,” enduring near-constant berating from a cellmate. She feared for her life, and prison authorities had denied her requests to meet with them. Quynhs’ mother, Ms. Nguyen Tuyet Lan, wrote a letter in December 2016 thanking Quynh's supporters. grave concern about the alleged arbitrary arrest and incommunicado detention of Ms.
the prohibition to receive visits from her family. We are deeply concerned that Ms.
legitimate exercise of her fundamental rights." The government did not respond to the letter. Quynh's detention was deemed arbitrary by the UN Working Group on Arbitrary Detention. Three UN Special Rapporteurs sent a letter to the Vietnamese government lamenting Nguyen Ngoc Nhu Quynh's arbitrary detention and the physical attacks and interferences with her peaceful environmental work over the years preceding her arrest. They asked for more information justifying her detention and surrounding the allegations of her mistreatment and for additional information on protections provided for peaceful human rights defenders in the country. Amnesty International issued an Urgent Action for Quynh to call on the Vietnamese authorities to ensure that she has access to adequate medical care. Quynh was one of the focus cases of the VOICE UPR campaign in late 2017. Quynh's 11-year-old daughter wrote a letter to the First Lady of the United States, Melania Trump, asking for her assistance in releasing her mother from prison on the occasion of the first family’s trip to Vietnam for the APEC summit in November. “Please help unite my family since I know my Mom did not do anything wrong and furthermore, you were the one to give her the ‘International Women of Courage’ award,” she writes. Read the full translation of the letter here. The 11-year-old’s nickname, Nam, which means Mushroom, inspired Quynh to take the name Me Nam, or Mother Mushroom. Civil Rights Defenders also released a statement calling on Cambodia, Burma, and Vietnam to end their crimes against and repression of journalists in those countries, citing the lengthy prison sentences given to citizen journalists Tran Thi Nga, Nguyen Ngoc Nhu Quynh, and Nguyen Van Oai in 2017 in Vietnam. They also released a statement on the one-year anniversary of her arrest calling for her unconditional release. Ted Osius, former US Ambassador to Vietnam, told Reuters that the administration had advocated for Quynh’s release, and the release of other prisoners of conscience, recently and on multiple occasions. November 15 marked the Day of the Imprisoned Writer. 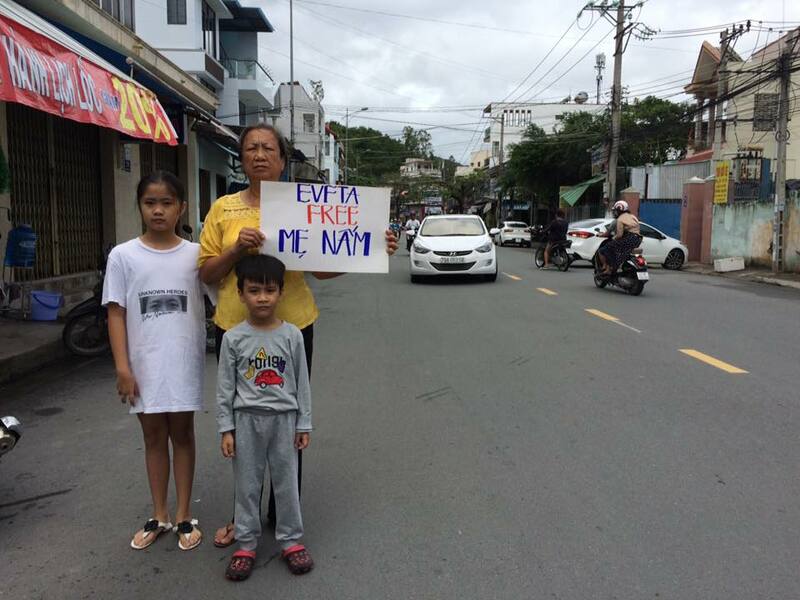 PEN International highlighted Mother Mushroom’s case, believing “that Me Nam is being targeted for peacefully exercising her right to freedom of expression.” PEN also encouraged supporters to take action for Quynh, calling for her immediate release. After her appeal was denied, several international human rights organizations and government officials, including the U.S. Chargé d’Affaires to Vietnam Caryn McClelland, condemned the decision. Ahead of the EU-Vietnam Human Rights Dialogue on December 1, the Head of the Delegation of the EU to Vietnam spoke out against the upholding of Quynh's sentence. Amnesty International released a new Urgent Action for Quynh, demanding that Vietnam release her immediately, provide adequate medical care until her release, and stop transferring political prisoners to prisons far away from their homes. On the ocassion of the first anniversary of her trial, Civil Rights Defenders again called for Quynh's immediate release from prison. Quynh was one of the winners of the Committee to Protect Journalists’s International Press Freedom Awards. A professor in Canada had also nominated Quynh for the Nobel Peace Prize. Dr Marc Arnal nominated her for her resilient activism. A Catholic church in Nghe An province screened a documentary about imprisoned blogger Quynh and her family. Vietnamese officials prohibited the film, called "When Mother's Away," from being shown at an event in Thailand shortly before. The event in Nghe An, however, drew a crowd of 1,000. Nguyen Ngoc Nhu Quynh's daughter wrote a thank you later to US First Lady Melania Trump. In her letter, she gave thanks to Melania and people around the world for assisting in her mother’s release from prison. She expressed happiness that after a long period of time, she can hug her mother, and that this year, she can celebrate her birthday with her mother and brother.